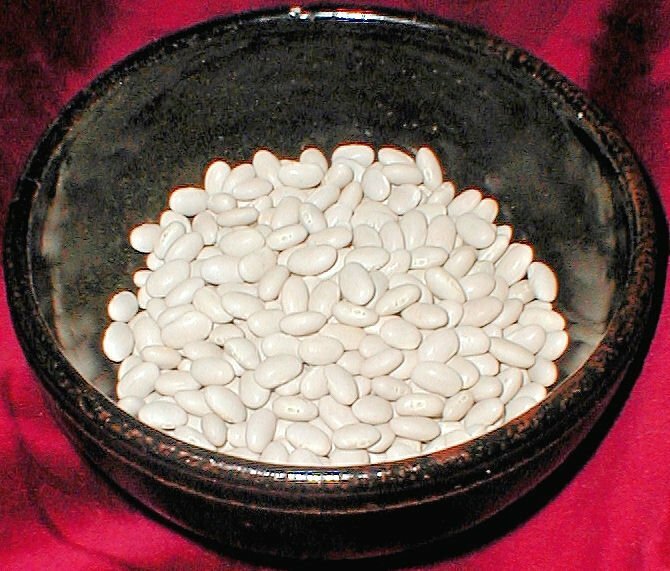 The navy bean or haricot bean is a variety of common beans (Phaseolus vulgaris). It is especially popular in the United Kingdom and the United States. The navy bean received its name because of its use as a staple for rations in the United States Navy during the 1800s. Here are 7 health benefits of the navy bean. 1. Navy beans can help keep your brain stay sharp. Folate plays a critical role in the regulation of specific amino acids that the nervous system requires. Studies have shown that a deficient amount of dietary folate can increase the homocysteine levels, which can be a dangerous precursor to neurodegenerative diseases like Alzheimer’s disease and Parkinson’s disease. One cup of navy beans contains 64 percent of the recommended value of folate. 2. Navy beans can help keep your heart healthy. Elevated levels of homocysteine are a risk factor for heart attack, stroke, or peripheral vascular disease and are found in between approximately 30 percent of patients with heart disease. Folate lowers the levels of homocysteine in the blood, decreasing these risk factors. Navy beans are also rich in magnesium. A one cup serving of navy beans contains 24 percent of magnesium. Magnesium helps the blood vessels relax and improves blood flow in the body. 3. Navy beans can assist in antioxidant defense. One cup of navy beans contains 48 percent of the mineral manganese, which is an essential cofactor in some enzymes essential in antioxidant defenses. 4. Navy beans can help you maintain a healthy blood pressure. Navy beans have a very high content of potassium and a low content of sodium. One cup of navy beans contains an amazing 708 milligrams of potassium, compared to 0 milligrams of sodium. This helps the blood vessels relax and maintains proper blood pressure. 5. Navy beans can help promote regularity. Navy beans are an excellent source of fiber. A one-cup serving of navy beans contains 19 grams of dietary fiber. The daily recommended dietary fiber intake for men and women are 38 grams and 25 grams, respectively. Dietary fiber can help prevent constipation, making one’s bowel movement easier to cope. 6. Navy beans are an excellent source of protein. One cup of navy beans contains 15 grams of protein, making it a great protein source for vegetarians. Navy beans contain all the essential amino acids that are needed by our body for good muscle-building. 7. Navy beans may help not spike blood sugar levels. The sugar in navy beans is slowly absorbed into the bloodstream, which prevents sugar crashes, sugar cravings, and mood swings. From a scale of 0 to 250, navy beans have a rating of 15 on the glycemic index scale. Mente, A., O'donnell, M. J., Rangarajan, S., McQueen, M. J., Poirier, P., Wielgosz, A., ... & Mony, P. (2014). Association of urinary sodium and potassium excretion with blood pressure. N Engl J Med, 2014(371), 601-611. Perez, V., & Chang, E. T. (2014). Sodium-to-potassium ratio and blood pressure, hypertension, and related factors. Advances in Nutrition: An International Review Journal, 5(6), 712-741.